Description: This Kalashnikov Sniper Rifle is a spring action operated rifle and it is equipped with real wood handguard and stock. 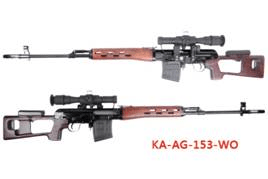 The rifle is having a glossy surface finishing similar to the real steel and a special designed piston head is used in the cylinder to reduce the noise and vibration when firing. There is a build-in side rail on the left side of the receiver for installing magnification scope. 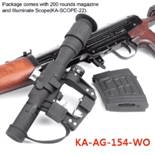 Package comes with a 50 rounds steel magazine, illuminate scope with 4X magnification (KA-SCOPE-22) and a detachable cheek pad. Description: This Kalashnikov Sniper Rifle is an electric operated rifle and it is equipped with real wood handguard and stock. This rifle is having a glossy surface finishing similar to the real steel. The quick spring changing designed gearbox helps the users to replacing the spring and adjusting the shooting power in seconds. Firing mode can be change with SEMI/AUTO by switching the semi/auto button near the trigger area. There is a build-in side rail on the left side of the receiver for installing magnification scope. Package comes with a 200 rounds steel magazine, illuminate scope with 4X magnification (KA-SCOPE-22) and a detachable cheek pad.